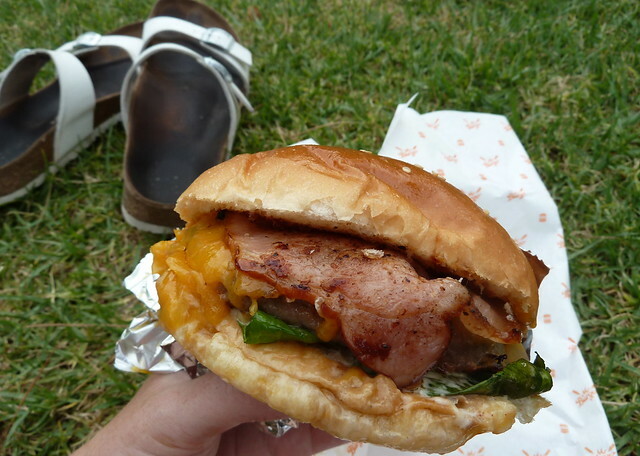 Footscray Food Blog: Food trucks a go go - tacos and burgers in the West! 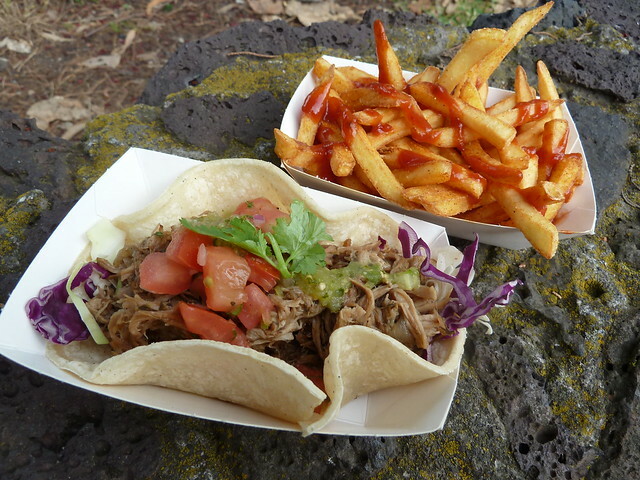 Food trucks a go go - tacos and burgers in the West! If you were burger deprived in childhood, weep no more - Mr Burger is here! 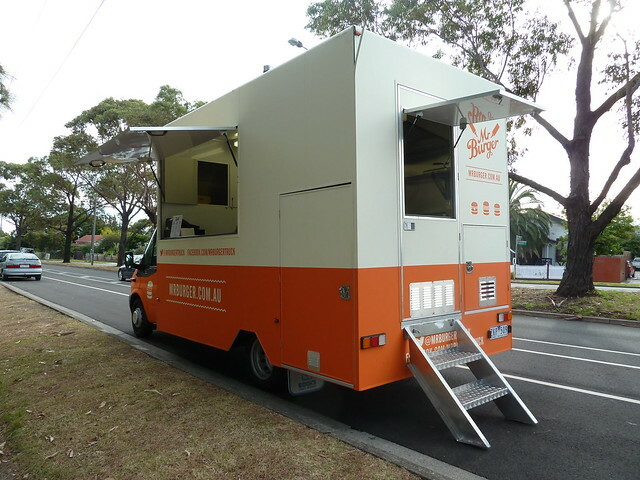 This is one spiffy food truck operation, with two trucks dotting Melbourne now. You'll find one semi-permanently tucked off Therry Street near the Vic Market, and one regularly roving around Melbourne including the western suburbs! I love their clean, zippy design. Ordering's a toss up between the "classic"Mr Burger with mustard, mayo and more, the Mr Meat with bacon and BBQ sauce, or the Mr Veg with a falafel patty. Fries are pretty standard but hot, salty and crisp - everything you could want! I reckon these are damn fine burgers. Both patties that day were a little pink, which I like - it's popular in the States to have your hamburger done medium. 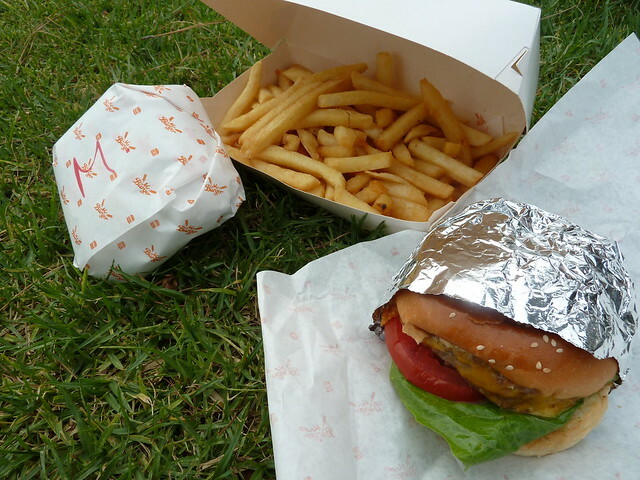 Often Aussie burgers taste like the sum of their parts, with dry-ish meat patty and chunky lettuce and tomato. Not so at Mr Burger - everything gooshes together to make a juicy, meaty party in your mouth. Love!!! But what's this? Two food trucks for the price of one! Dos Diablos have also starting spreading their brand of tasty hellfire across the West. ...and we love a pulled pork or "carnitas" taco, well-seasoned meat loaded generously onto a proper corn tortilla and dressed up with tomatillo salsa and a little shredded cabbage. Wickedly good fries, too, tossed with seasoned salt and squirted with spicy ketchup. 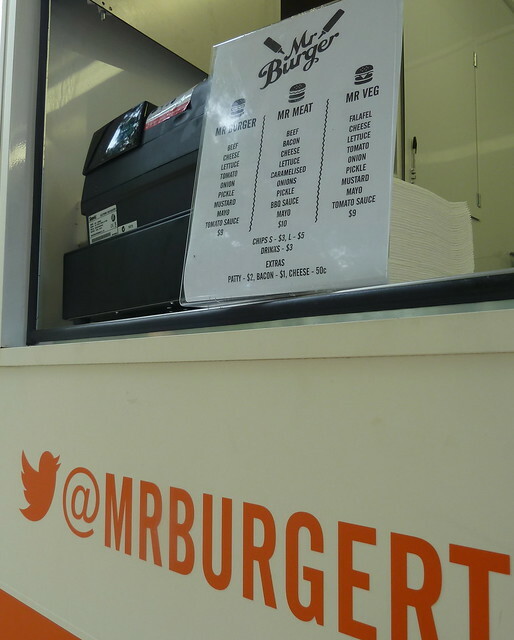 Best of all - tomorrow, Saturday 9th Feb, Mr Burger will be at Pilgrim Street Park and the Horsey Park! (Bristow Reserve, Seddon and Shorten Reserve, West Footscray). 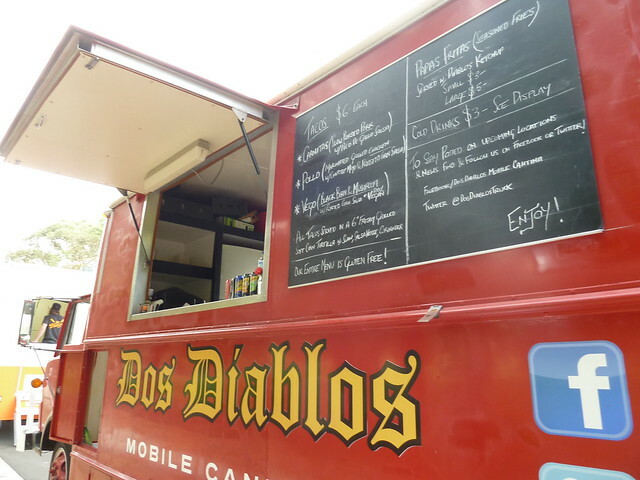 As for Dos Diablos, keep your eye on their Facebook page for today and tomorrow's tasty incarnations! Well, I guess that's tomorrow's lunch unavoidable. Shorten Reserve is so close to home! The west's first food truck - Whits Guy Cooks Thai! Hi anon, I hit WGCT back in Dec but still have to check out the frozen yoghurt truck - soon, my pretties, soon! And then there is yogurddiction - the froyo truck! White Guy cooks thai is still a stand out. Dos Diablos the jury is still out especially with places like Los Latinos and Besito around. Taco truck in Yarraville tonight which I haven't tried. MASSIVE thanks for Taco Truck tip Lily! I will definitely be following them more closely now! I have only tried Gumbo Kitchen which was in he city one lunch out all all the food trucks in Melbourne. Hopefully I will get a chance to try some now that they are so much closer to home! Candice, I'm dying to try Gumbo Kitchen. Seemed perfect when they were at Docklands but then they got booted out. Maybe we can entice them west. I'm loving the food trucks - such a lovely relaxed dinner and a great way to explore local parks too. Great way to find these guys when you're out and about rather than searching through multiple facebook/web pages. 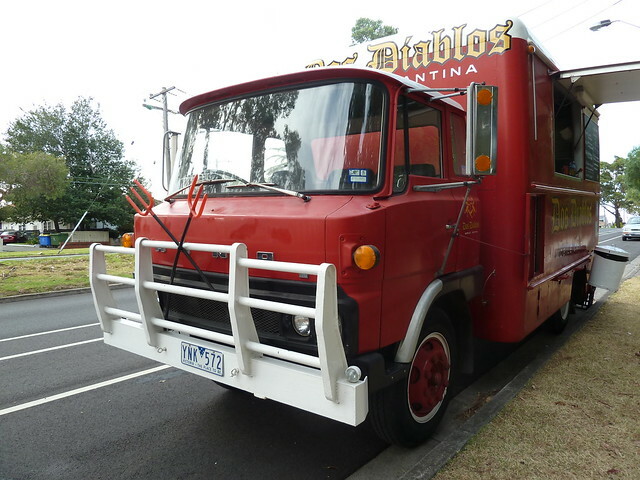 Hi Charbig, I just had a quick look at wherethetruck.at and I think White Guy, Dos Diablos and Mr Burger are on there? Def agree it's a good idea. Food truck goodness! As much as I'm always drooling over other people's escapades at food trucks, I'm kicking myself at the same time because I still haven't been to one! I love the whole idea of it from the nifty set up, to the straightforward menu with 5 items or less and yes. I'll have to make most of the gorgeous weather lately to hunt one of these babies down. Thanks for telling us abt this! Tacos and live music at Footscray's The Rev!